The CHL holds an all-time record of 63-25-1-6 in the event, while Russia won its 32nd game in event history in Game 5 on Tuesday in Sherbrooke. The QMJHL holds an all-time record of 17-11-3 in the CIBC Canada Russia Series. They have responded with a win in their second game in four out of the seven times they lost their first encounter against Russia. The CHL enters Game 6 trailing in points for the first time since Russia last won a series in 2014. Russia won Game 6 of that series by a score of 3-2 in Rimouski. Team QMJHL must win in regulation tonight for a chance to decide the series in a shootout for the second straight year. 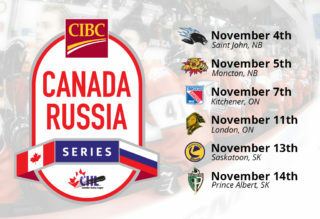 The CIBC Canada Russia Series returns to Drummondville for a CHL record-tying fourth time following games in 2005, 2009 and 2010. The last contest saw Russia take a 4-3 win behind a two-goal performance from Nikita Dvurechensky. Voltigeurs star Sean Couturier had two assists. LAVOIE, POULIN REMAIN ‘A’ RATED SKATERS: NHL Central Scouting’s November Players to Watch List was unveiled earlier this week and Team QMJHL forwards Raphael Lavoie (Halifax Mooseheads) and Samuel Poulin (Sherbrooke Phoenix) remained atop the QMJHL list as ‘A’ rated skaters, indicating they could very well be first round picks in the 2019 NHL Draft next summer. CHL’s POWER PLAY STRUGGLES CONTINUE: The CHL is a collective 0-for-16 on the power play to this point in the series as compared to Russia’s 2-for-11 showing. The CHL has never been held scoreless on the power play in the history of the event. STARKOV LEADS RUSSIANS, QMJHL ADDITIONS PROVE VALUABLE: Held off the scoresheet for the first time in the series on Tuesday, Stepan Starkov leads Russia in scoring with five points (1-4—5). QMJHL additions Pavel Koltygin (Drummondville), Alexander Khovanov (Moncton), Ivan Chekhovich (Baie-Comeau) and Dmitry Zavgorodniy (Rimouski) all chipped in with points in Sherbrooke.